I can not get enough of this book. There isnt enough of this book series to ever quinch my thirst for the land of Alagaësia, or its inhabitants! This is by far one of the best book series and most definitely my favorite! 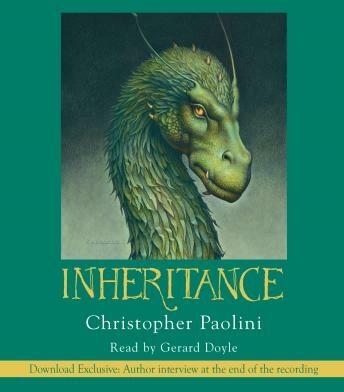 I will always want to know what is going on in this book series and I hope to God Christopher Paolini continues these writings one day! Love the characters and the Doyle's ability to bring them alive! Love the entire series and I hope Doyle reads book 5 when it comes out! Great story. Sometimes Eragon argues points like a child and it becomes frustrating as a reader/listener. But in the grand scheme it disappears and the whole of the story is well worth it. Dewey Stevens is an idiot. This book was everything I waited for in a 4th and final chapter in this story. Left me wanting more and my imagination running wild!!! I have read and own all the books and now I have listened to them, I love these books. I like the narrator for the most part I just don't like the voice/Growl he does for Saphira. Absolutely loved this series and the narrator was amazing! Definitely looking forward to another book with Eragon and Sapphira!